Robin Robins is the founder and CEO of Technology Marketing Toolkit, Inc., the IT industry’s largest, most successful sales and marketing firm, providing sales and marketing strategies, tools, templates and training. We also run the largest C-level, mastermind peer group in the IT services industry, with over 5,400 active members in one or more of our membership programs, and 8,000+ clients over the 18 years we’ve been in business. Our clients are willing to invest in the growth of their organization, sales and marketing as evidenced by the heavy investment they make into our membership programs and coming to our events. We seek to attract only the top 20% of CEOs with genuine entrepreneurial ambition, those who will actually invest in marketing. You’ll get access to our members, who make up a unique group of IT services CEOs (MSPs, VARs, IT consultants) in the IT services channel. 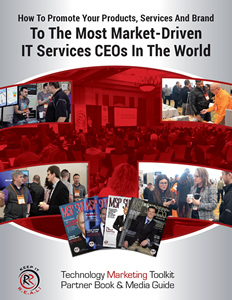 They are the MOST INFLUENTIAL resellers of IT services, hardware, software and communication systems, acting as the IT department for hundreds of thousands of small to mid-size businesses from around the world. If your company sells any kind of technology solution to small-medium businesses (SMBs), you need to work with our members! You’ll get the HIGHEST ROI from our events over any other events you may have sponsored (watch the video below to hear multiple sponsors convey this).That’s because our IT services CEO members are serious about growth and have invested serious time and money into marketing, sales and expanding the IT services offerings to their clients. They are ALWAYS eager to discover new tools, software and technology solutions they can resell and recommend to their clients. You will be assisted by our senior sponsorship consultants who are dedicated to your successand will offer strategies to maximize your sponsorship investment, build brand recognition and generate a solid, return on your marketing investment. We will work with you to customize the perfect sponsor opportunity to fit your specific goals and brand-building ideas.Yes, we have standard sponsorship packages that work; but we can also offer any combination of focus groups, technology labs, speaking sessions, lunch-and-learn workshops, plus a wide variety of unique “experiences” that will build name recognition and engagement and drive sales. We consistently deliver the highest quality and quantity of attendees at our events, workshops, webinars and websites. Our numbers always reflect a true and accurate representation of the audience we attract.